Mangaluru, May 03, 2018: Dr Austin D’Souza Prabhu, who is at present in Mangaluru, on a vacation is slated for another award too as just announced. It is an honour in the form of the Community Service Award at the 2018 Secretary of State’s Celebration of Asian Pacific American Heritage Month. Jesse White, Secretary of the State of Illinois in his letter dated April 25. The award will be conferred on May 15, at Illinois. Earlier, Council of the Village of Forest Park, Cook County, Illinois, US, at it’s meeting presided by Mayor Anthony T Calderone took pride in dedicating a portion of Dunlop between York and Polk in honour of Dr Austin D’Souza Prabhu, a Mangaluru-born multifaceted personality, who is living in Forest Park, Illinois, for the past 37 years by naming a portion of Dunlop between York and Polk as “Dr Austin Prabhu Way”. The dedication and unveiling programme will take place on May 26. 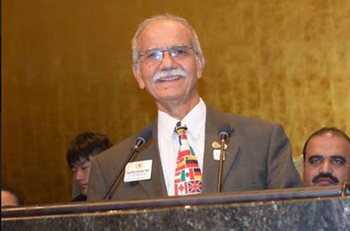 Dr Austin’s life has been focussed on civic-mindedness and academic goals, whereby he earned his PhD at the University of Illinois and dedicated 39 years to Lions Club at the district, state and international levels. Dr Austin’s dedication to the Lions Club has seen him become the District Governor in 2004 and 2012. He is the first person of Indian origin to become the Governor of District 1A (Mother District of Lions Club – Chicago. Dr Austin’s commitment to the principles of the Club and to the service of those less fortunate has been his driving force. Dr. Austin also served two terms as President of India Catholic Association of America, one-time Secretary of the Federation of Indian Associations in Mid-America, Treasurer of the Federation of Indo-American Christian Associations of North America, Director of New Republic of India, Advisor of International Biographical Center (Cambridge, England), editor and publisher of three local news magazines in India, among others. The ’Mangalore Today’ Magazine May 2018, to be on the stands at the week-end will carry a special feature on Dr.Austin D’Souza Prabhu.